Cheap doesn't always have to be crap. You could go out and buy yourself a darn decent used car with fairly low mileage and, if you’re lucky, some time left on the factory warranty. There’s nothing like letting the first buyer pay the depreciation on your behalf. However, there’s something about being the first owner of a car. No one else has placed their greasy fast-food eating hands on the steering wheel. No one has messed with the controls or backed it into a mailbox. And then there’s that new car smell. 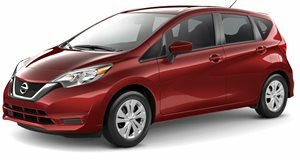 Fortunately, the 2017 Nissan Versa Note is the five-door hatchback that you can buy brand new for not a lot of dough. It’s the affordable brand new car. How affordable? Base price is just $14,230. Our tester, a top-of-the-line SL, came to a grand total of $19,915 all in, including destination. Yes, that figure is a bit high for some but not everyone needs all of this car’s features. Plus, only one engine is offered: a 1.6-liter inline-four with 109 hp and 107 lb-ft of torque. The interior is, for the most part, nicely laid out but we have a few gripes because of the hard plastics and the CVT transmission. Overall, the 2017 Nissan Versa Note is a five-door hatchback that’s a solid daily driver for a fair price out the door. Special thanks to Future Nissan for letting us film the car.